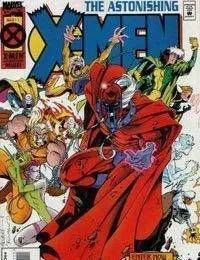 Magneto has gathered his X-Men together, and warns that any who participate in the upcoming raid probably will not be coming back alive. The gathered X-Men accept this and acknowledge their loyalty to Magneto. He is discussing his doubts about the existence of their world, when Blink and Sunfire come teleporting into the late Charles Xaviers Mansion in Westchester County. They were losing a battle to an Infinite named Delgado, so she came back to the mansion. Unfortunately, Sunfires flames are out of control. Iceman manages to cool Sunfire down, but Delgado comes through Blinks teleportation aura. Blink closes the portal on him. Killing the prelate in the process. Sunfire briefs the X-Men on the result of his and Blinks mission: Apocalypses son Holocaust has begun a new round of cullings.